Boxing is going through an amazing revival in the Basque Country in recent years, at least in the Southern Basque Country and especially in the province of Bizkaia. Kerman Lejarraga (Morga, Bizkaia, 1992) and Andoni Gago (Bilbao, 1985) are the most notable examples of this, each in his category, becoming European champions. Before that, many years ago, Jose Manuel Ibar Urtain (Aizarnazabal, Gipuzkoa, 1943 – Madrid, 1992) was the most important representative of boxing in the Basque Country, but he also had important predecessors, especially two of them. The first, a very famous and extolled boxer, Paulino Uzkudun (Errezil, Gipuzkoa, 1899 – Madrid, 1985), and the second, less known and more overlooked than what he deserved, Isidoro Gaztañaga (Ibarra, Gizpuzkoa, 1905 – La Quiaca, Argentina, 1944). Because of boxing, Uzkudun and Gaztañaga lived outside the Basque Country, especially in America, where they had countless experiences and adventures, not just fights, and kept a silent and stubborn struggle going between each other outside the ring that lasted for many years. Paulino Uzkudun Eizmendi, as a young man, became known as an Aizkolari or woodchopper, one of the Basque rural sports. But once he set aside the ax and tried boxing gloves, it didn’t take long to prove that he was in a position to compete with the best in the world. Due to his origin, when he became a renowned boxer, he was given the nickname the Basque Woodchopper in the United States of America. 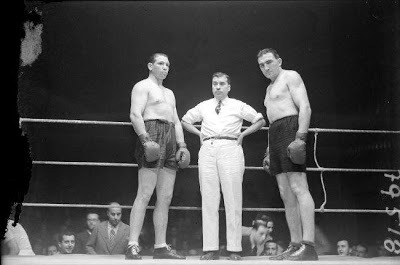 Uzkudun was proclaimed heavyweight European Champion three times: In 1926 in Barcelona, after beating Italian Emilio Spalla by decision; in San Sebastian in 1928 with a knockout to German Ludwig Haymann; and in Madrid in 1933 after beating Belgian Pierre Charles by decision. In another memorable fight held in 1927, he knocked out the American Harry Willis, who was one of the best fighters in the world at that time. 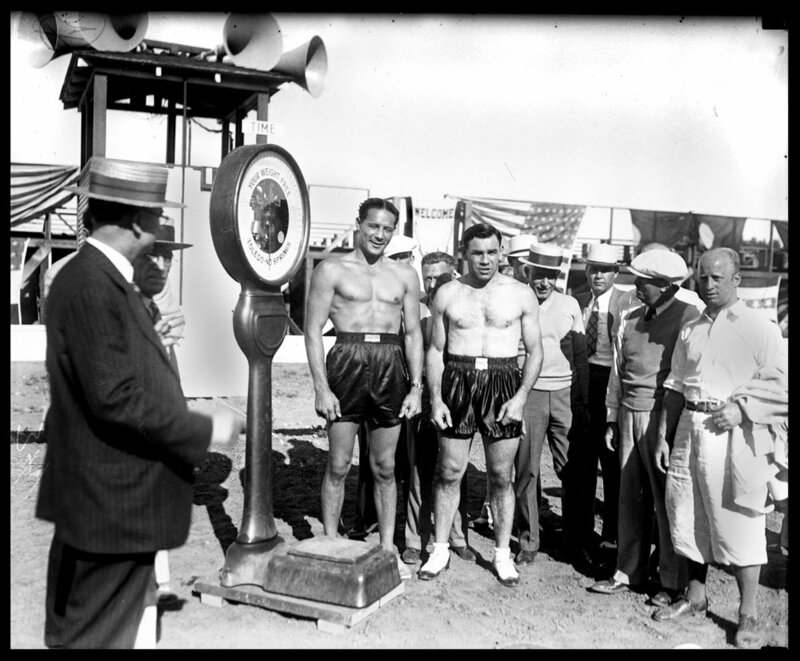 In 1933 he fought Italian Primo Carnera in Rome for the world title, but he lost by decision. He also fought against other boxers who were world champions: Joe Louis, Max Baer and Max Schmeling. Altogether, Uzkudun participated in 70 fights, of which he won 50, tied 3 and lost 17. Of his 50 victories, 34 were knockouts. Among those who beat him, Joe Louis was the only one to bring him down winning by a knockout in 1935 at Madison Square Garden in New York, which was also his last fight. After being sent to the canvas by Louis in the fourth round, Uzkudun wanted to continue fighting, but the referee didn’t allow it. Uzkudun was a Falangist (extreme right Spanish movement) and when the Spanish Civil War of 1936 began, he was arrested in Pasaia, Gipuzkoa, by members of the anarchist union CNT, but members of the Basque National Party of Zarautz, Gipuzkoa, helped him escape. 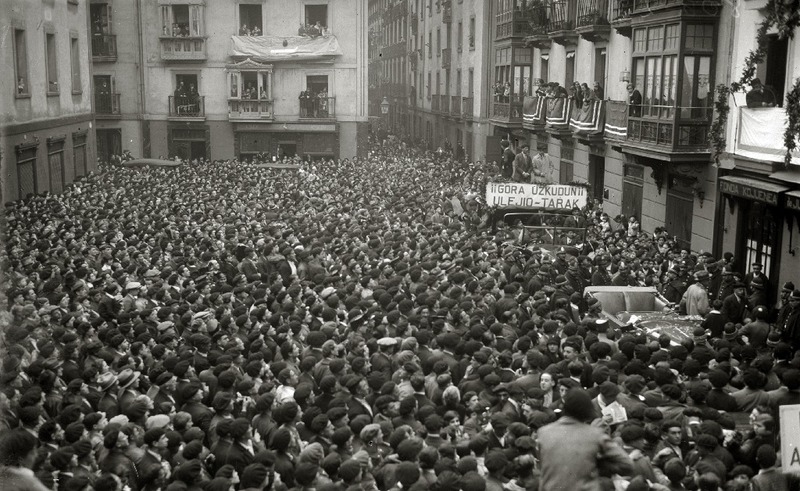 Later, according to testimonies of the time, he participated in many executions carried out by Franco supporters, acting threateningly and cruelly, and in some cases, he even personally chose some prisoners who would be shot. Some witnesses have told very harsh stories about Uzkudun, the Falangist. After the war, Uzkudun became a propaganda symbol of Franco’s dictatorship. Isidoro Gaztañaga (named at birth: Isidro Gaztañaga Otegi), was 6 years younger than Uzkudun and was taken to Paris in 1926, when he was 21 years old, to be developed as a boxer in the Anastasie gymnasium, since he had shown great promise for success. Due to these talents, he received a call to go to the United States of America and very soon began to stand out in fights that took place in the USA, Cuba, Uruguay and Argentina, fundamentally because he was a great boxer, but also because of his great looks. He was baptized in those countries with nicknames like Izzy Gaztañaga, El Bello Izzy (the beautiful Izzy) or El Martillo de Ibarra (the hammer from Ibarra). He was a boxer of great physical strength and he showed it frequently by sending many of his opponents to the canvas in KOs, but he didn’t take care of himself and had many ups and downs which led him to lose many fights that in theory, he should have won. He splurged the money he earned in boxing with ease, taking himself to the cliff’s edge on several occasions through his carelessness. He would stop training frequently and acted irresponsibly, consuming alcohol and tobacco. That’s why he never caught Uzkudun’s records. In spite of all this, he won some spectacular fights against high-level boxers, and that was the reason there were few boxers who dared to face Gaztañaga. They say that he wanted to fight against Joe Louis who was intimidated and preferred to confront Uzkudun, thinking that he would more easily overthrow the boxer from Errezil than the one from Ibarra. Although at the beginning the relationship between both boxers was good, as the years passed, the animosity between them grew. 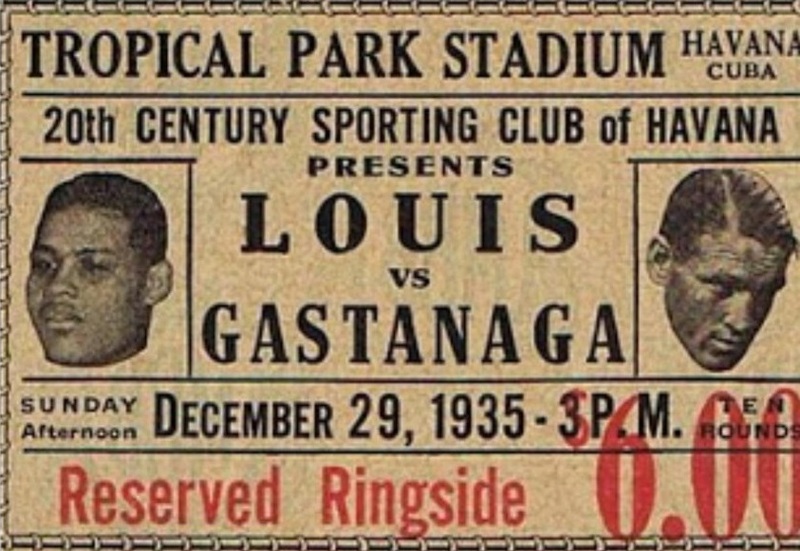 They say that an important promoter wanted to organize a fight between Uzkudun and Gaztañaga, as a symbol of the combat between the two sides of the Civil War. The promoter wanted to dress Uzkudun with red and yellow pants, the colors of the Franco flag and Gaztañaga with red, yellow and purple pants, the colors of the republican flag. Gaztañaga refused to participate in such a show and Uzkudun, it is said, sighed a breath of relief with the refusal, since he was afraid to confront him face to face in the ring. The biographies of Uzkudun and Gaztañaga could be used as abundant sources of inspiration for novels or film scripts, full of big revelries and convoluted love stories, but also with the presence of famous personalities such as Al Capone, Dolores del Rio, Gary Cooper, Lupe Vélez, Ernest Hemingway and Clara Bow, among others. 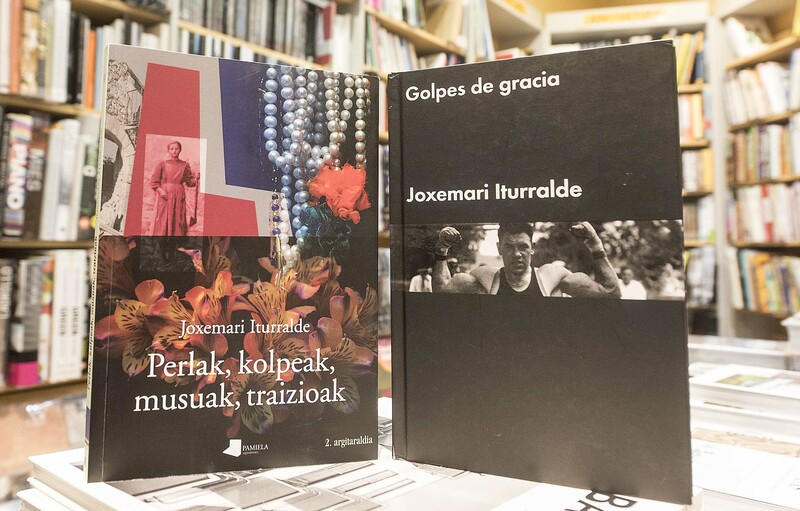 The writer Joxemari Iturralde realized this, collected a lot of data from their biographies and in 2015 published the novel in Basque Perlak, kolpeak, musuak, traizioak (Pearls, blows, kisses and betrayals) by Pamiela. It was based on the biography of Uzkudun and Gaztañaga but added fictional details to the actual events. The Spanish version was published in 2016 by the Malpaso publishing house, with the title Golpes de Gracia (Graceful Blows), with the translation done by the writer himself and a prologue by Ignacio Martínez de Pisón. Also on the table, is the project of making a film based on the novel. Be the first to comment on "Uzkudun and Gaztañaga: a Stubborn, Symbolic Fight Outside the Ring"